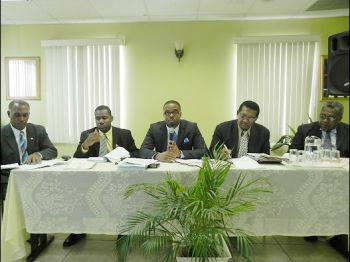 Basseterre, St. Kitts (WINN): Opposition Parliamentarians have changed their “Motion of No Confidence” against the leadership of Prime Minister Dr. Denzil Douglas to a “Resolution of No Confidence” in the government. Mark Brantley, the Leader of the Federal Opposition, made the announcement Tuesday at a press conference hosted by the St. Kitts opposition People’s Action Movement and the Nevis- based Concerned Citizens Movement at the conference room of the St. Kitts Cooperative Credit Union. “I should tell the general public that we have this morning filed a slightly amended version of that Notice of Motion because we were advised that the Notice of Motion as drafted and as worded yesterday appeared to be skewed more towards the prime and we wanted to make it pellucid that it applies not just to the prime minister but obviously to the government that he leads,” Brantley said, confirming that the new motion was filed Thursday morning. “As currently advised we are in parliament tomorrow to debate the Increase in Senators Bill and we shall see how that goes, but of course we expect to be back there next week Tuesday for the Budgetary Debate,” said Brantley while acknowledging there were questions as to when the motion would be heard. “Our understanding of the parliamentary practice and procedure in other Commonwealth countries is that this motion, a motion of this significance, ought to come on as soon as possible, and, indeed, ought to take precedent s over any other business. That, however, will be a matter for the Speaker and the Speaker’s Office,” Brantley said. “Resolution of the National Assembly of Saint Christopher and Nevis for a Vote of no Confidence in the Government of St Kitts and Nevis caused by the poor Leadership of Prime Minister the Rt. Hon. Dr. Denzil L. Douglas. WHEREAS since the installation of the Rt. Hon. Dr. Denzil L. Douglas as Prime Minister of St Kitts and Nevis and Leader of the Government of St. Kitts and Nevis our Federation has been governed in a manner which has undermined our Constitution, has led to disastrous economic outturns and a lack of public confidence in his leadership and in his government. AND WHEREAS the Prime Minister has constantly and willfully disregarded the Constitution of the Country. AND WHEREAS the Prime Minister has undermined the Ministerial system of Government as prescribed in the Constitution. AND WHEREAS the Prime Minister has failed to consult the Country prior to the Land for Debt Swap Agreement with the St Kitts-Nevis and Anguilla National Bank Ltd with the resultant sellout of our patrimony. AND WHEREAS the Prime Minister has refused to effect a decrease in electricity rates in St Kitts with the result that household and commercial consumers find themselves unable to pay some have had to return to early 20th century modes of lighting with lamps and candles. AND WHEREAS the Prime Minister has refused to uphold a system of good governance thereby destroying the public service. AND WHEREAS the Prime Minister has mismanaged the financial affairs of St. Kitts and Nevis thereby incurring a massive national debt with defaults on bond payments and the imposition of haircuts without regard to the consequences for bondholders and the Country’s financial image. AND WHEREAS the Prime Minister has refused to have full ventilation with the Nation on the IMF conditions relative to the public debt. AND WHEREAS the Prime Minister displays unruly parliamentary behavior even threatening to sell a fellow national. AND WHEREAS the Prime Minister has attempted to further increase the number of senators in parliament in the face of the IMF calls for a lessening of public expenditure. AND WHEREAS the Prime Minister has instituted the SIDF as an alternative to the consolidated fund to receive moneys which constitutionally are to be paid into the consolidated fund and thereby insulating the foundation from parliamentary and audit scrutiny and oversight. AND WHEREAS the Prime Minister has as Prime Minister and Minister of Elections publicly supported the previous Supervisor of Elections in defying the directive of the Electoral Commission with the result that hundreds of registered voters in Nevis were illegally removed from the Voters List in Nevis causing tremendous harm and damage to the reputation of the electoral system in St. Kitts and Nevis. NOW THEREFORE, BE IT RESOLVED that this Honourable House expresses its concern and lack of confidence in the Government of St. Kitts and Nevis caused by the poor Leadership of Prime Minister, the Rt. Hon. Dr. Denzil Douglas. 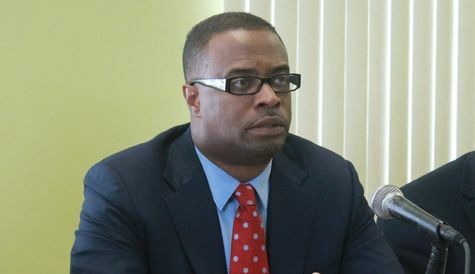 Wednesday, Mr. Brantley outlined the thinking behind the Opposition’s decision to ask Parliament to approve a “No Confidence Motion” against Dr Douglas. BRANTLEY: We feel that the country has reached to a critical juncture; that things are not getting any better that the management style and the leadership style of the Prime Minister, are not getting any better, and that now we see that that disrespect that has been the hallmark of his leadership is now even affecting and infecting Members. Where he no longer has regard even for members of his own Cabinet, members of the government side, and we feel that enough is enough to put it bluntly. That we have as an opposition, certain tools that are available to us in terms of… in terms of Parliament and that it is time that we deploy those tools. We are aware that no motion of no confidence has come before the parliament during Dr. Douglas’ tenure and we feel that it is time that that motion be put and that those who are willing to support it and those who are interested in a new paradigm and a new style of leadership and a new style of governance and a new direction for the country will support it both on the opposition benches and the government benches. WINN: You are filing a No Confidence Motion against the Prime Minister. Is it that you should file against the Prime Minister, or against the government? Which section of the Constitution applies in this case? BRANTLEY: Well our view is that the motion of no confidence is in the Prime Minister, in his style of leadership, it’s very similar to what have been done elsewhere...um obviously the government stands or falls with the Prime Minister, it is of course open to other possibilities which I shan’t get into now, but the reality is that we are saying and we are making it very specific, it is the leadership style and the absence of management skills that have brought St Kitts and Nevis to its knees and that is what we are seeking to have ventilated in the House of Parliament. WINN: If you a file a motion of Confidence against the Prime Minister, even if you achieve that vote it may not have any effect on the Prime Minister or the government, does the Parliament have the power? Or, is just the Governor General who would have the power to disappoint the Prime Minister? BRANTLEY: Well I mean it’s… it’s I understand the point that you are raising I.. I think that that’s a matter that certainly we are looking at because we don’t want any technical arguments to surface...um…the reality is that I believe that you and everyone will be clear of what our intent is and the government of Prime Minister Douglas and Prime Minister Douglas himself will be asked to account on the basis of this motion in Parliament. That is the avenue that is available to us and that is what we have come to Parliament to do. Now when this comes before Parliament I would imagine that whatever points that can be made will be made but at the end of the day I do not think we ought to lose sight of the big picture here which is to call into question and require an account of the stewardship of The Right Honourable Dr. Denzil Douglas. WINN: …To the issue of what happens after a motion is filed… you require a three -day notice before the next sitting of parliament…there may be a sitting on Friday ..if you have Budget Day, I am told the only matter discussed on that day is the Budget. Is there any way that you think you would be able to have your motion heard on Budget Day or on Friday? BRANTLEY: These are matters which we will discuss in the Speakers’ office, its being done on the time tabling of this motion as we understand it but…budget will be heard on Tuesday of next week. We do have a sitting that has been scheduled Friday to deal with the senators, the increase of Senators Bill but we will certainly be in close contact with the Speakers’ office to talk about scheduling. I would not to preempt the speaker because certainly he controls the House and it would be a matter for him in terms of scheduling this very important and historical matter.